Total Audio Inputs: 2 x XLR. 2 x RCA. Total Audio Outputs: 2 x XLR Program 2 x XLR Monitor. Timecode Connections: 1 x XLR Timecode in and 1 x XLR Timecode out. Video Input Re-sync: On all 20 inputs. SDI Video Inputs: 20 x 10-bit HD/Ultra HD 4K switchable. 2 channel embedded audio. Extra Audio Outputs: 1 x XLR Timecode and 1 x XLR Talkback. SDI Audio Outputs: 2 Ch embedded into SDI output on all outputs. Extra Audio Inputs: 1 x XLR Timecode and 1 x XLR Talkback. SDI Program Outputs: 3 x 10-bit HD/Ultra HD 4K switchable. Down Converted SDI Program Output: 1 x 10-bit (From Ultra HD 4K to HD). 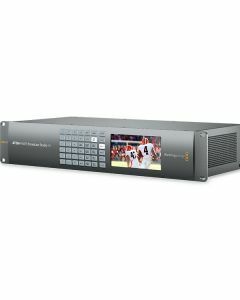 SDI Preview Outputs: 1 x 10-bit HD/Ultra HD 4K switchable. Quantity of Multi Views: 2 x SDI. Multi View Outputs: 2 x SDI. Tally Output: Added via ethernet connection to Blackmagic Design GPI and Tally Interface product. (Not included). Computer Interface: 1 x USB 2.0 port. SDI Compliance: SMPTE 292M, SMPTE 424M, SMPTE 2082. Upstream Keyers: 16 with Chroma/Linear/Luma key. Transition Keyer (Stinger/DVE): 1 Stinger, 1DVE . Control Panel: Software or optional hardware panel. Multi View Monitoring: 2 x 10 Views for 20 total views. Multi View Video Standard: Select HD or Ultra HD. Media Pool Still Image Capacity: 64 with fill and key. Media Pool Clip Capacity: 2 with fill and key. media-player Clip Length in 720 HD: 3200 frames. media-player Clip Length in 1080 HD: 1440 frames. media-player Clip Length in Ultra HD: 360 frames. Media Pool Video File Format: TGA Sequence. Media Pool Audio File Format: WAV, MP3 and AIFF. Front panel: Built in HD LCD monitor for video and 42 LED buttons for Aux switching. 4K to HD Down Conversion: Yes, program x 1. Control Panel Included: ATEM Software Control Panel included free for Mac OS X 10.11 El Capitan or macOS Sierra 10.12 or later and Windows 8.1 64-bit or Windows 10 64-bit. Software Updates: Using USB 2.0 connection directly connected to Mac OS X or Windows computers. Includes ATEM Setup Utility. Configuration: Set via ATEM Software Control Panel, excluding ATEM chassis IP address which is set via the ATEM Setup Utility connected via USB to chassis. Power Supply: 2 x Internal 110 - 240 AC. Physical Installation: 2 Rack Unit Size.